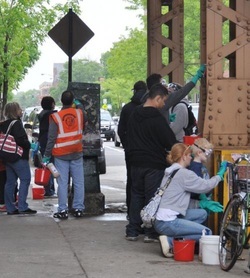 A team of 1st Ward graffiti removal "heroes" are looking for like minded neighbors on May 26 at noon starting at Clemente High School, Division and Oakley, and June 2 at 10 a.m. at Wicker Park, 1425 N. Damen. They swooped thru the community before with capes flapping cleaning up the visual landscape, recruiting others along the way. In one case a mother and son who used to live in Wicker Park, stopped as the team was preparing for their sweep up Damen. They decided to spend time to help with the clean-up. The gratification and pleasure the "heroes" experience prompt them to want to spread the enthusiasm, relieving instructor Adam Natenshon of the duty of training all the newcomers. "It is amazing," said Natenshon, "that everyone gets so into the work. It is fairly quick and easy to remove the tags and that makes it fun too." include SoSafe USA, Clean City innovations, LLC, Wicker Park Bucktown Chamber of Commerce, SSA #33, West Town Chicago Chamber of Commerce and SSA #29. Natenshon became aware of the line of graffiti removing products while working on the Hairpin Lofts project at Diversey and Milwaukee. © GraffitiActionHero.org All Rights Reserved.